Rather than just rip out the overgrown jungle that she found in her yard when she moved into her home six years ago, Jennifer Matyjasik is trying to preserve the history of the 1930s house and honor the avid gardener who once lived there. Her neighbors told her that the woman who had owned the house, along with her sister, were great gardeners. Matyjasik is trying to honor that as she fashions her new landscape. As she cut back the thicket, she saved the black raspberry bushes that she found, and loves having the berries on her yogurt in the morning. Matyjasik was also able to rescue hydrangea and rose bushes. She built a new, larger patio, but incorporated stone steps that were original to the house and probably came from a quarry in Clarence. 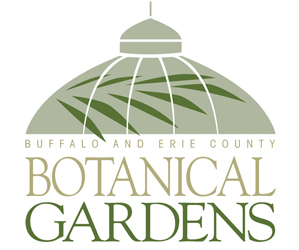 See the remnants of the original garden as well as new additions in Matyjasik’s gardens at at 73 Garden Pkwy., Williamsville, during the Village of Williamsville Garden Walk to be held from 10 am. to 4 p.m. Saturday, July 18. An urn found half-buried in the yard was rescued, replanted given a prime spot. The walk is free. Pick up maps at the welcome tent at Williamsville Village Hall, 5565 Main Street, Williamsville, the day of the walk. A basket worth more than $400 will be raffled off. 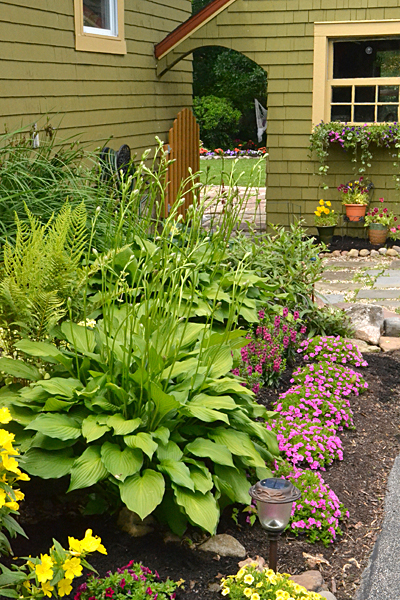 New this year is a fairy garden contest, which includes any kind of container garden. Your creation must be small enough for you to carry to the welcome tent. Entries will be displayed along the sidewalk on “fairy lane” between Village Hall and the Williamsville Library, 5571 Main St. The organizers would like folks to preregister for the contest by July 10 so they can know how many entries to expect, but walk-ins are allowed. The contest is free and open to the public. Get an entry form and rules here. 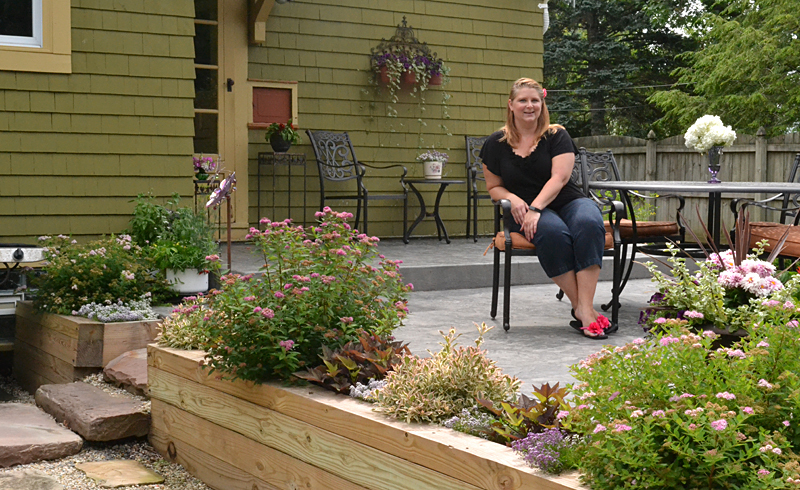 Judging will be done by the public from 10 a.m. to 2 p.m. during the garden walk. A golden gnome will be awarded to winners. The contest will be kicked off by a fairy parade at 10 a.m. on the sidewalk. Adults as well as children can dress up as fairies, gnomes or superheroes. You can decorate your wagon or stroller. 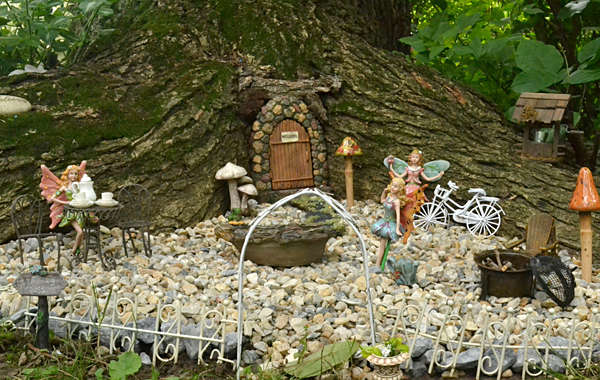 Matyjasik (pronounced Matt-uh-jay-sick) has her own fairy garden, but she won’t be entering it into the contest because it’s built into the roots of a large tree in her backyard. The figurines represent her and her two nieces. 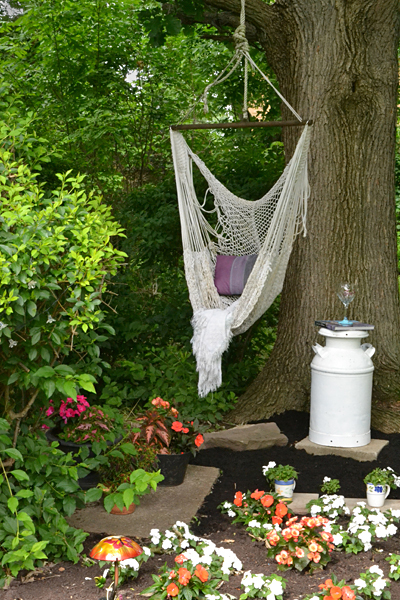 The tableau includes a fire pit and tea cups, items that she actually has in her yard. Matyjasik has been taming her yard section by section. As she hacks through the overgrown shrubbery, she sometimes finds what she calls treasures. One was an urn, half-buried, that is probably 50 years old. 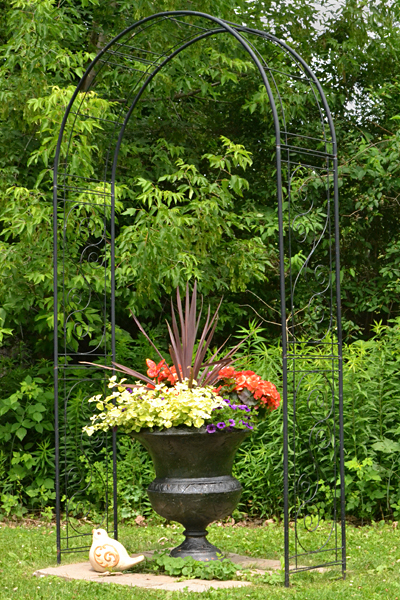 She cleaned it, painted it, replanted it with flowers and gave it a position of honor under an arch. Other treasures were found in the house. 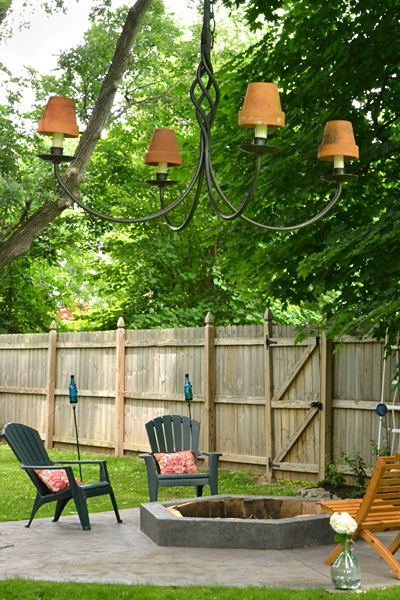 An old chandelier and tiny terra cotta pots became a decoration to hang in the branches of a tree. Old enamel kitchen pots were set on the patio to hold herbs. She brings the potted herbs inside for the winter, where they do well until about February. A hidden garden area near a tree was ringed by not one, but two rows of forsythia bushes. She cut down one row and made a shade garden that includes impatiens, which are doing well so far this year. Flowers are planted in tea mugs, too, but because it is such a shady area, they don’t need to be watered that often, she said. A comfortable hammock is a great spot to relax on a hot day. In addition to preserving the history of the house, Matyjasik likes to use her gardens to preserve her own family memories. Her late mother was an avid gardener, and Matyjasik has a rhododendron from her garden. There are black-eyed Susans, which her mother liked, and forget-me-nots, which her father loved. Matyjasik has a double lot and her gardens are extensive. During dry weather, she can spend an hour a day watering. Projects take up a lot of her free time. One of the prettiest parts of her landscape is the garden along the driveway with a view into the backyard. I like her creative chandelier. That raised bed/wall looks a bit narrow for what looks like Limemound Spirea which grows 4 feet wide and 3 feet high. Lots of trimming, but possible loss of flowers. Munstead Lavender may have been a better choice as a slow growing plant that stays 1-1.5 feet high. Plus the fragrance at the sitting area… just a suggestion. Jennifer, what beautiful gardens you have! I live in the Village and have driven by your home on many occasions and always wondered who did such a lovely renovation on this property! Now I know. Way back in the 70’s, my husband and I rented a home a few doors from yours-so I have nostalgia for the neighborhood. I hope to visit during the Garden Walk on the 18 th. keep up the good work. Beautiful Jen. I was hoping to do the Williamsville Garden Walk this year but I have a another commitment on that day. I am hoping I can still fit in time to stop by and see your garden. 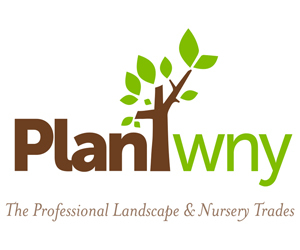 Do you need anyone to sit there and watch the flowers grow while you are at work? There is nothing more peaceful than a garden big or small. Enjoy!